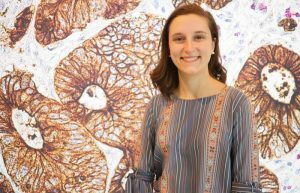 Alissandra Hillis ’18 has spent all four years at MIT in the same cancer metabolism lab, deciphering the basic science behind pancreatic cancer. Senior Alissandra Hillis attributes her appetite for the basic sciences to her craving for fundamental knowledge. She’s spent her four years at MIT in the same lab, committed to unraveling the molecular mechanics of pancreatic cancer — the fourth leading cause of cancer death for both men and women, given that symptoms do not often appear until the disease is quite advanced. In doing so, Hillis became enthralled by the prospect of breaking down life into its most fundamental, biological units to decipher cellular function and disease. Originally a Course 7 major with a chemistry minor, she declared Course 5-7 (Chemistry and Biology) as soon as it became available in the fall of 2017 — applying her study of biochemistry and cell metabolism to cancer research. Hillis joined Matthew Vander Heiden’s cancer metabolism lab the first semester of her freshman year, and has been there ever since. For nearly two years, Hillis has been investigating the role of one enzyme, pyruvate kinase muscle isozyme M2 (PKM2), in pancreatic cancer. PKM2 is responsible for catalyzing the final step in glycolysis, which is required to create the energy that fuels cells. Glycolysis is also important in tumor metastasis and growth, since cancer cells demand energy in order to proliferate. Cancer cells often preferentially express PKM2 over other types of pyruvate kinases such as PKM1. This spurred William Israelsen PhD ’14, a former graduate student in the Vander Heiden lab working in breast cancer models, to delete the PKM2 gene and see what happened. Since PKM2 is critical for glycolysis, and cancer cells require energy to proliferate, he anticipated that removing PKM2 would hinder energy production and thus disrupt tumor development. To his surprise, he found the opposite: deleting PKM2 actually accelerated tumor formation and promoted liver metastasis in mice. In his 2014 paper, Israelsen concluded that PKM2 might permit cancer cells to maintain their “plasticity,” shifting from one specialized role to another even after they’ve fully matured. In the absence of PKM2, he proposed PKM1 might take over PKM2’s influential role. Hillis wondered if she could replicate Israelsen’s breast cancer results in a model for pancreatic cancer, especially given the conflicting findings in human data regarding PKM2 expression in the latter. Some studies suggest that high PKM2 expression correlates with accelerated disease, whiles others indicate just the opposite: that high PKM2 expression is associated with better survival rates. Right now, her working hypothesis holds that PKM2’s influence varies depending on the tissue in question. This might explain why her own results don’t exactly parallel what Israelsen found in his breast cancer model. For instance, the method they were using to delete PKM2 is quite effective in the breast and pancreatic cells themselves, but less so in the dense scar-like tissue characteristic of pancreatic tumors in particular. It’s possible, she thinks, that this fibrous tissue may still express some PKM2 even post-knockout, perhaps hindering both a drastic decrease in lifespan and increase in tumor size. Hillis hopes piecing together PKM2’s mechanism of action will help us better diagnose — and eventually treat — certain cancers. Her most recent results were published in the November 2017 issue Cancer & Metabolism. Although Hillis enjoys tackling the more fundamental questions concerning cancer, she’s also interested in translating this work from bench to bedside. That’s why she decided to intern with David Ting at the Massachusetts General Hospital Cancer Center this past summer. 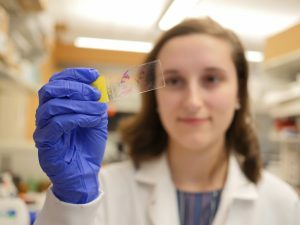 Although she was still a junior at the time, she contacted Ting — an MIT alumnus with a dual degree in 7A and 10 — and together they fashioned a summer position just for her, studying the role of miniscule, fluid-filled transportation structures called exosomes in cancer development and diagnosis. As Hillis begins her final semester at MIT, she’s continuing her work in the Vander Heiden lab, while also finishing up the requirements for her HASS concentration in legal studies. She’s still set on pursuing a PhD in cancer biology, but the propensity to ask tough questions that drew her to science in the first place has led her to realize that the questions she raises in her own research have ramifications far beyond her lab bench. Taking policy-oriented classes in addition to her science-related ones has inspired her to pursue a law degree in conjunction with her PhD — weaving together her love for science with a newfound interest in the rules and regulations that govern how science is funded, performed, shared, applied, and monetized.